If you’re a giant fan of The Walking Dead, and I’m assuming everyone reading this is, then this Sunday is probably the biggest day of your TV-watching year, as Season 5 will come to what will hopefully be a masterful end. But that’s not all that audiences will be rewarded with, as the world will get its first look at a trailer for the upcoming (and still untitled) Walking Dead spinoff series. AMC has confirmed that the first promo for the companion series – which is apparently the preferred way to refer to it – will air after the 90-minute Walking Dead season finale, right before Talking Dead airs. The trailer will presumably air in the place of their “Next Week On…” spot, but I’m really hoping they present it in full-screen mode, rather than shoving it into a quarter of the screen while the credits roll. I doubt it will be a very lengthy promo, so it needs to be shown in full glory. 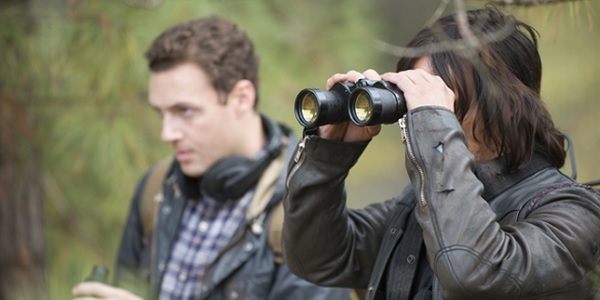 Here’s how we assume Daryl and Aaron will be watching it from out in the woods. Called “Cobalt” and “Fear the Walking Dead” at different points, the new show will kick off on the West Coast just as the zombie apocalypse is taking over, making it a temporary prequel to the flagship zombie drama. It will center on two families that come together in desperation as the end of days appear to loom near. One is headed by Sean Cabrera (Cliff Curtis), a divorced teacher with a rebellious and intelligent teenage son named Cody. Kim Dickens will play guidance counselor Nancy Tompkins, a girl next door with a bite who’s raising drug-addled son Nick (Frank Dillane) and ambitious daughter Ashley (Alycia Debnam Carey), the latter of whom wants to strike out on her own. AMC gave the companion series a two-season order earlier this month, with the first of Season 1’s six episodes scheduled to premiere this summer at some point. The second season, which will presumably feature more episodes, will air in 2016. We can probably expect at least one death on The Walking Dead’s season finale, as only two guests have been confirmed for Talking Dead: Norman Reedus and showrunner Scott Gimple. A secret special guest doesn’t always mean a big death, as sometimes it just happens to be an unexpected celeb. But come on, it’s the finale! Tune in for that and the spinoff promo on Sunday, March 29, at 9 p.m. ET.